***mma-text-adsense.shml***Randy "The Natural" Couture is, without doubt, one of the most renown MMA fighters ever. He, along with Chuck Liddell, helped make MMA the popular sport it is today and is thought by many to be the best ever. For a great selection of Couture fan gear the UFC Store is the place to go. His records speak volumes. He is a three-time former UFC (Ultimate Fighting Championship) heavyweight champion and two-time light heavyweight UFC champion. He and B.J. Penn are the only UFC fighters to ever have held a championship in two divisions. 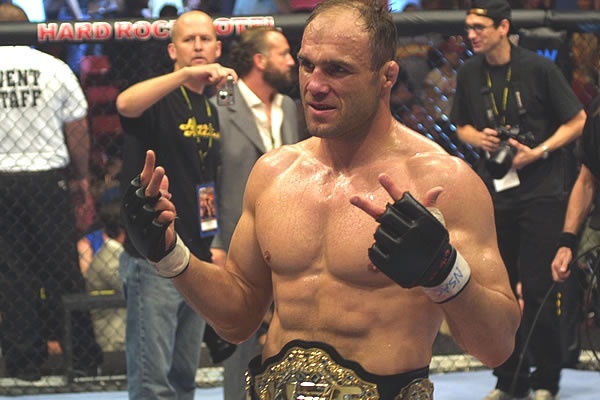 Randy Couture also holds the record as being the only fighter to win five UFC championships. He has competed in 15 title fights which is another record. He is a hall-of-famer and is the only fighter to win a championship after being inducted. Born on June 22, 1963, Randy Couture is the oldest man to win a UFC fight. He is also the oldest title holder. What is behind this record-holding MMA guru? Couture has heavy wrestling roots although he is also versed in Brazilian Jiu-Jitsu, Muay Thai and boxing. Randy Couture began wrestling when in middle school in Lynwood, Washington and later in high school where in his senior year he won the State Championship. He then joined the army where he served for four years, from 1982-1988. Randy Couture won the National collegiate Athletic Association (NCAA) Division 1 All-American three times and twice was runner up at Oklahoma State University NCAA Division 1. In 1988 and then again in 1992 and 1996, he was an Olympic wrestling team alternate and in 2000 he was a semi-finalist at the Olympic trials. It was in 1992 after Randy saw a video taped UFC event that he made the decision to enter into mixed martial arts and the rest is history. On May 30, 1997 he made his debut at UFC 13 in Augusta, Georgia. In a four-man tournament, Randy Couture was first up against Tony Halme, a former wrestling pro with World Wrestling Entertainment, aka Ludvig Borga. Although he was outweighed by close to 100 pounds, Randy Couture came on strong with a double-leg takedown followed by some serious ground and pounding. He finished the job off with a rear naked choke and won the bout only one minute into the first round. Next in the tournament was Steven "3-d" Grahan who also far outweighed Couture. With more ground and pounding Randy took the fight TKO three minutes and thirteen seconds into the first round. It would be on October 17, 1997 at UFC 15 that Randy Couture would make a name for himself. The fight was against Vitor Belfort a young, fast blackbelt in Brazilian Jiu-Jitsu under Carlson Gracie. Vitor was known for his punches and was to be in the Olympic trials in boxing for Brazil. Couture was definitely the underdog. But "Mr. Natural" would not back down. It started out a bit rocky with Couture dodging Vitor's powerful punches but once to the ground, Couture had control. Vitor got back to his feet. Randy then landed so many punches Vitor gave in. The fight ended up back on the ground where Couture came from a back mount with punches that won him the fight via TKO 8:17 into the first round. The fight was one of the biggest upsets in MMA history. Randy Couture became a sensation and the number one challenger for the Heavyweight Championship. On December 21, 1997 at UFC Japan , also known as UFC 15.5, Randy Couture faced off with Maurice Smith for the Heavyweight Championship. Defending his title for the second time, Smith played it cautious, calculating Randy's every move. Eventually Couture was able to get in several takedowns and from there positioned his control and won the fight by unanimous decision twenty-one minutes into the first round. He was the new UFC Heavyweight Champion. But the title reign would take an interesting twist. 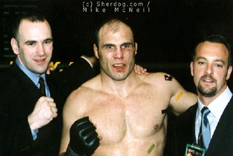 In 1998, Randy Couture was expected by the UFC to defend his title in a fight against Bas Rutten who was the former King of Pancrase. This is a mixed martial arts wrestling organization in Japan. Randy opted to fight Enson Inoue instead. He was stripped of the title. In January, he left the UFC due to a dispute with his contract. The fight with Inoue did not go well. When the bout went to the ground, Couture had to tap out due to an armbar and he lost one minute and thrity-nine seconds into round one. The next fight would go equally as bad. Up against Mikhail Illoukhine in March of 1999 for Japanese Rings, Couture lost by submission due to a Kimura in the first round. It was a controversial call by the referee. Frustrated, Randy Couture left MMA and went back to wrestling where he made the semi-finals for the 2000 Summer Olympics. But Randy just couldn't keep away from the sport he loved. In October at the Rings King of Kings 2000 Tournament, he took on Jeremy Horn who he beat by unanimous decision five minutes into round three. He went on to win against Ryushi Yanagisawa by unanimous decision as well. With the two wins under his belt, Randy Couture qualified for the tournament finals in 2001. In an effort to win the UFC heavyweight title, Couture went up against Kevin Randleman on November 17 2000 at UFC 28: High Stakes. Though Randleman came on strong, taking Couture down early on, Couture survived the ground and pound attempts and went on to trip Randleman taking the fight to the ground again, but this time under his control. After applying strikes from the full mount position, the referee stopped the fight and Couture won by TKO 4:13 of the third round. Randy took the UFC Heavyweight Championship for the second time and became the first MMA fighter ever to do so. The Rings King of Kings 2000 tournament finals were held in March of 2001. The first fight was a win via unanimous decision against Tsuyoshi Kosaka, but he then lost in the semi finals to Valentijn Overeem due to a guillotine choke only fifty-six seconds into the first round. Now back with the UFC, Brazilian kick-boxer, Pedro Rizzo was Coutures first opponent in his title defense at UFC 31: Locked and Loaded on May 4, 2001. The event was the first UFC under the management of the new president Dana White and would prove to be a fight to remember, one of the most brutal in MMA history. Both fought long and hard until Couture finally won by unanimous decision five minutes into the fifth round. There was so much controversy that a rematch was scheduled for UFC 34 in November but Randy easily took Rizzo by TKO in round three. On March 22 2002, Randy Couture defended his title against Professional wrestler Josh Barnett at UFC 36: Worlds Collide. Although Barnett won the fight by TKO 4:35 into the second round and secured the Heavyweight title, he was later stripped of the title due to testing positive for steroids. In an attempt to regain the title, Randy Couture met up in the ring against Ricco Rodriquez in UFC 39: The Warriors Return on September 27, 2002. Couture held the fight for three rounds but was taken down by Ricco and fell victim to an elbow strike which broke his orbital bone (eye socket). Ricco won the fight via submission. Randy Couture decided to move down to the light heavyweight division due to his two losses against fighters who outweighed him. The first bout would be against the legendary number one contender for the light heavyweight championship, Chuck Liddell in UFC 43: Meltdown. By far the underdog, Randy Couture came out with flurries of strikes which lasted three rounds til he took the fight to the ground and from the mount position, won TKO via punches 2:40 in the third round. The championship was his making him the first UFC fighter to win title championships in two weight classes. "Captain America" became Randy's new nickname. Tito Ortiz was the next contender. The fight was in September of 2003 at UFC 44: Undisputed and was for exactly that, the undisputed Light Heavyweight Championship title. There was more to the fight than just the title, however. In a trilogy drama, Liddell had been after Tito to fight him but Tito refused stating Liddell had taken an oath early in their careers that they would never fight due to friendship. Liddell denied having ever said such a thing and it was speculated Tito was afraid to fight him. With Couture having beat Liddell, Tito vs. Couture looked to be as close to Tito vs. Liddell as it would get. It was the fifth time Tito defended his title and he fought hard to continue his three and a half year reign but his efforts would prove to not be good enough. Five minutes into the fifth round Couture won via unanimous decision and became the Light Heavyweight Champion at age 40. In a title defense fight, Couture went up against Brazilian Jiu-Jitsu blackbelt, Vitor Belfort again. Though Couture had beat him before, such was not the case in January of 2004. Early in the first round Vitor took Couture with a left hook that caused a nasty cut, ending the fight in a doctor's stoppage. In an attempt to gain back the title, Randy went in the ring for a rematch on August 21 in UFC 49: Unfinished Business. Appropriately named, the event was redemption for Couture who dominated the entire fight and won five minutes into the third round when he inflicted a cut on Vitor which caused a medical stoppage. Once again, Randy was the reigning victor making him a two-time Light Heavyweight Champion as well as a two-time Heavyweight Champion. On April 16, 2005 at UFC 52 in Las Vegas, Nevada, Couture and Liddell faced off for a rematch. This time Couture did not fare so well and suffered his first knockout in the ring two minutes and six seconds into the first round. After a win over Mike Van Arsdale in August, Randy fought Liddell yet again on February 4, 2006 at UFC 57. Victim to yet another knockout, Randy lost 1:28 into round two and wasted no time in announcing his retirement from MMA. He had had enough. Couture kept busy during his retirement. He became a commentator at UFC events and co-hosted another MMA show. He appeared on the Rob Schneider film, "Big Stan" and on a reality show, "Pors vs. Joes" and even starred in the movie, "The Scorpion King 2: Rise of a Warrior"
He went back to wrestling as well, taking on the Brazilian Jiu-Jitsu champ, Ronaldo "Jacare" Souza. The match ended in a draw. Though Randy's retirement was far from boring, he could not stay away from MMA and found himself back in the ring on March 3, 2007 against UFC Heavyweight Champion, Sylvia at UFC 68: The Uprising. It was a sold out event, the largest to date, with 19,079 spectators. Couture did not disappoint, delivering steady strikes and effective takedowns, winning by unanimous decision five minutes into the fifth round and taking the title once again. "Captain America" was now the Heavyweight Champion for the third time at the age of 43. UFC 70 was next on the list. In August, Couture fought Gabriel Gonzaga. Although he won the bout, he did not come out of the ring unscathed. Gonzaga had broken Randy's arm when he had tried to block Gonzaga's powerful kick. Once again, Couture retired from MMA. The decision was based upon a heated dispute with the UFC concerning multiple complaints. But almost a year later, Randy would resurface in a "three fight deal". The first fight would be at UFC 91 against Brock Lesnar on November 15, 2008. Randy was 45. Though the fight was close at the beginning, Lesnar ended up knocking Couture out in the second round with a series of hammer fists and won TKO. Antonio Rodrigo Nogueira was Couture's next opponent. Nogueira was the former UFC interim Heavyweight Champion as well as former Pride World Heavyweight Champion. It was the first fight of a new "six fight deal" which replaced the old agreement. The bout took place at UFC 102 on August 29. 2009. Although the two fought a very competitive, seemingly even match through most of the fight, Nogueira pulled out to win via unanimous decision five minutes into the third round. Randy returned to the ring in the Light Heavyweight division on November 14 in UFC 105: Couture vs. Vera. Up against Brandon Vera, Randy controlled the fight via the clinch and won by unanimous decision 5:00 of round three which made him the oldest fighter to win a fight in the UFC. He was 46. UFC 109 took place on February 6, 2010. It featured Couture and Mark Coleman, aka "The Hammer", who is also in the MMA hall of fame and who wrestled Couture and won by one point at the 1989 Olympic Festival. Coleman is a four-time Olympic alternative and is just one year younger than Couture. The bout set the record for the oldest combined age of fighters. It was also the first fight where two Hall of Famers went up against each other. Just one minute into round two, Couture defeated Coleman by technical submission via rear naked choke. The next fight was against James Toney who was a multiple world boxing champion. It took place at UFC 118 on August 28, 2010. Early on Couture dominated the fight and within minutes of the first round submitted Toney. It was his fifth victory in seven fights. Randy had expressed interest in facing off against Lyoto Machida and the UFC set it up for him to do exactly that at UFC 129 on April 30, 2011. With 55,000 fans watching, Machida won by KO in the second round. After the fight, at the age of 47, Randy Couture retired stating he was "finally done fighting." Couture is twice divorced but continues to support his second ex-wife, Kim, in her MMA career. He has three children and resides in Las Vegas. He has a successful line of clothing and gear, gym equipment, nutrition products and more.